The shows Website now updated. Entrance fee is $5 per day and kids 12 and under get in for free so bring the whole family for a weekend of fun. Classes are plentiful and actually start on Thursday. Classes are listed here with further details: Some classes you will register with the instructor directly and links/instructions are listed for each accordingly. 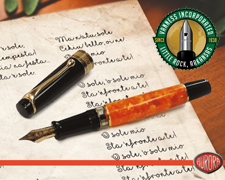 Friday from 7pm-9pm I will host the Fountain Pen Day Pens & Friends meet. It is a casual gathering of pen people to relax and share your passion. This is the time to find out you are not alone in your obsession for pens, paper and ink. I will gather up some great raffle prizes and have a LE Colorado Pen Show 2016 / Fountain pen Day pin for everyone as well. Saturday & Sunday after the show you will see there is little needs to run home as many will gather in the bar/restaurant area to meet up and show what they brought and what they bought. I will be there those nights as well looking to meet as many enthusiasts and enablers as possible. Please feel free to ask any questions and email me. Where after show shenanigans occur. Michael Sull doing what he does so well.